The Korowai, also called the Kolufo, are the people who live in southeastern West Papua in the Indonesian Province of Papua, close to the border with Papua New Guinea. They number about 3,000. "Until the late 1970s, when anthropologists embarked on a study of the tribe, the Korowai were unaware of the existence of any peoples other than themselves". The Korowai language belongs to the Awyu–Dumut family (southeastern Papua) and is part of the Trans–New Guinea phylum. A dictionary and grammar book have been produced by a Dutch missionary linguist. Tree houses built by the Korowai people in Papua, Indonesian New Guinea Primarily for the benefit of film crews as true Korowai homes are only 5 to 10 meters above the ground and are not built on stilts but fastened to crowns of tall trees. It has been claimed that the majority of the Korowai clans live in tree houses on their isolated territory, but the BBC revealed in 2018 that the Korowai had constructed the tree houses "for the benefit of overseas programme makers" and did not actually live in them. Since 1980 some have moved into the recently opened villages of Yaniruma at the Becking River banks (Kombai–Korowai area), Mu, and Mbasman (Korowai–Citak area). In 1987, a village was opened in Manggél, in Yafufla (1988), Mabül at the banks of the Eilanden River (1989), and Khaiflambolüp (1998). The village absenteeism rate is still high, because of the relatively long distance between the settlements and the food (sago) resources. The Korowai appear to now smoke tobacco but not to drink alcohol. The Korowai are hunter-gatherers and horticulturalists who practice shifting cultivation. They have excellent hunting and fishing skills. Information about Korowai trade patterns is scant. The Korowai have a few gender-specific activities, such as the preparation of sago and the performance of religious ceremonies in which only the male adults are involved. Some Korowai have since the early 1990s generated moderate cash income by working with tour companies selling tours into the Korowai region. Within the tourist industry, opportunities are limited to hosting tour groups in villages for tourist-sponsored sago feasts, carrying luggage, and performing traditional displays. The patriclan is the central unit with respect to social, economic, and political organization. Kinship terminology follows the Omaha I pattern (Lounsbury), knowing a central opposition between cross and parallel relationships. In Korowai society the forms of institutional levirate and predominance of avuncular relationships are found, as well as a kind of affinal avoidance relationships. Marriage is exogamous and polygynous. Preference is given to a conjugal relationship with the (classificatory) mother's mother's brother's daughter. Leadership structures are based on personal qualities of big men, rather than on institution. Interclan warfare occurs mainly because of witchcraft and sorcery-related conflicts. The Korowai universe is filled with all kinds of spirits, some more personal of character than others. Reverence is paid especially to the red headed, (Ginger) God, Gimigi. To Gimigi, the creator spirit, the Korowai do not ascribe an important role in their daily lives. Once in a lifetime, a Korowai clan must organize a sago grub festival in order to stimulate prosperity and fertility in a ritual fashion. In times of trouble they sacrifice domesticated pigs to the spirits of the ancestors. The Korowai have an extraordinary and rich oral tradition: myths, folktales, (magical) sayings and charms, and totem traditions. With respect to death and afterlife the Korowai believe in the existence of a reciprocal type of reincarnation: those who died can be sent back at any time to the land of the living, by their kinsmen in the land of the dead, in order to reincarnate in a newly born infant of their own clan. The first documented contact by Western scientists with members of a band of western Korowai (or eastern Citak) took place on March 17–18, 1974. The expedition was co-led by anthropologist Peter Van Arsdale (now at the University of Denver), geographer Robert Mitton, and community developer Mark (Dennis) Grundhoefer. Thirty men were encountered on the south bank of the Upper Eilanden River, approximately 12 miles east of its junction with the Kolff River and 10 miles north of the Becking River. A basic word list was generated and observations were recorded regarding such things as fire making techniques. In the late 1970s, a few Christian (Dutch Protestant) missionaries began to live among the Korowai. Dea Sudarman, an Indonesian anthropologist, made several documentary films on the Korowai for Japanese television in the 1980s. In 1993, a film crew documented an anthropological study in the Dayo village area by the Smithsonian Institution of Korowai treehouse construction and the practice of cannibalism as a form of criminal justice. This resulted in the film Lords of the Garden. In 1996 a local Christian community was established, the members of it mainly originating from the neighbouring Kombai people. For a long time the Korowai have been considered exceptionally resistant to religious conversion; however, by the end of the 1990s the first converts to Christianity were baptized. In the autumn of 2003, a small team of Bible translators from Wycliffe/SIL moved to Yaniruma. In May 2006, tour-guide Paul Raffaele led an Australian 60 Minutes crew to report on the people. After a few days' filming, the crew were allegedly approached by a man who claimed his 6-year old nephew Wa-Wa had been accused of being a khakua (witch doctor), and was in danger of being cannibalised. The 60 Minutes crew declined to offer assistance. Paul Raffaele approached the rival Seven Network, who agreed to send a Today Tonight crew to remove Wa-Wa from the area. Before being able to gain access to them, the crew were deported by Indonesian authorities at the Papuan capital of Jayapura over visa issues. The 2007 BBC Documentary "First Contact", presented by Mark Anstice, features footage from his 1999 encounter with members of the Korowai people, and describes how they were disturbed upon seeing a "white ghost", whose presence indicated the end of the world was nigh. 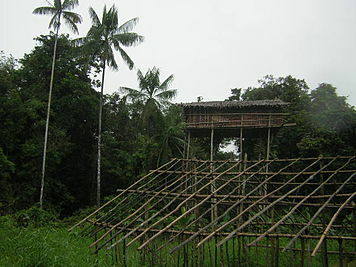 In January–February 2011, the BBC documentary Human Planet commissioned the Korowai building of a treehouse 35m high. The Korowai have been reported to practice ritual cannibalism up to the present day. Anthropologists suspect that cannibalism is no longer practiced by the Korowai clans that have had frequent contact with outsiders. Recent reports suggest that certain clans have been coaxed into encouraging tourism by perpetuating the myth that cannibalism is still an active practice. The distinctive high stilt architecture of the Korowai houses, well above flood-water levels, is a form of defensive fortification – to disrupt rival clans from capturing people (especially women and children) for slavery or cannibalism. The height and girth of the common ironwood stilts also serves to protect the house from arson attacks in which huts are set alight and the inhabitants smoked out. ^ "Korowai in Indonesia". PeopleGroup.org. Retrieved 24 September 2014. ^ Nathalia, Telly. 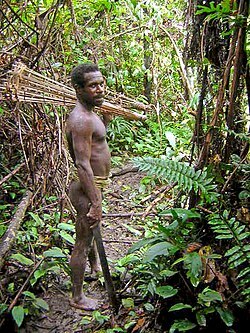 Indonesia census turns up Papua tribe living in trees. Reuters. ^ Indonesian Korowai Tribe First Officially Recognised As Tree-Dwellers The Telegraph Jul 08, 2010. Visited Jan 29, 2013. 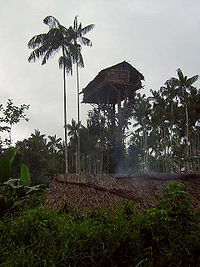 ^ a b Sustainable living: Korowai tribe and tree houses. BBC. ^ Hays, Jeffrey. "KOROWAI PEOPLE: PAPUA'S PINT-SIZE, TREEHOUSE-LIVING CANNIBALS | Facts and Details". factsanddetails.com. ^ Burke, Steve. "Economics: How do the Korowai make a living?". korowaitribe.tumblr.com. ^ "Tribal Art - Mixed lot (3 items): New Guinea, Asmat territory: three tobacco pipes with fine incised decoration. - Dorotheum". www.dorotheum.com. ^ Gros, Martin. "The Korowai Tribe". Maptia.com. ^ Slama, Martin; Munro, Jenny (2015). From ‘Stone-Age’ to ‘Real-Time’: Exploring Papuan Temporalities, Mobilities and Religiosities. ANU Press. ISBN 9781925022438. ^ "Stone Korowai Tribe | Cultural Trek | West Papua". whistlingarrow.com. ^ Enk, Gerrit J. van; Vries, Lourens de (1997). The Korowai of Irian Jaya: Their Language in Its Cultural Context. Oxford University Press. ISBN 9780195355635. ^ Van Arsdale, Peter. "Director of African Initiatives and Adjunct Professor at the Josef Korbel School of International Studies, University of Denver". Retrieved 4 March 2014. ^ Van Arsdale, Peter (March 1974). Report of an Expedition to the Interior Asmat and Citak Regions of Irian Jaya, Indonesia. University of Denver: Unpublished document. pp. 1–32. ^ Mitton, Robert (1983). The Lost World of Irian Jaya. Melbourne: Oxford University Press. pp. 136–157. ISBN 0-19-554368-8. ^ Camellia Webb-Gannon (23 November 2015). "Salvaging Democracy for West Papuans in the Face of Australia-Indonesia Obstruction". The Asia-Pacific Journal: Japan Focus. Retrieved 24 November 2016. ^ "Wycliffe Bijbelvertalers" (in Dutch). Retrieved 25 October 2006. ^ Ben Fordham (21 May 2006). "Last cannibals". NineMsn. Archived from the original on 21 August 2006. Retrieved 25 October 2006. ^ Kia. "Korowai Tree Houses". Atlas Obscura. Retrieved 25 November 2016. ^ Erica Tennenhouse (26 July 2016). "Modern-Day Human Cannibalism". The Science Explorer. Retrieved 25 November 2016. ^ John Garnaut (18 September 2006). "Cannibals may be feeding the lies". The Sydney Morning Herald. Retrieved 25 October 2006. Korowai: in Encyclopedia of World Cultures – Supplement (Editors: Melvin Ember, Carol R. Ember, and Ian Skoggard) pp.183–187 by Gerrit J.van Enk. Macmillan Reference United States / Gale Group (ISBN 0-02-865671-7). Korowai Treehouses and the Everyday Representation of Time, Belonging, and Death. by Rupert Stasch. The Asia Pacific Journal of Anthropology. 12(3): 327–347. Textual Iconicity and the Primitivist Cosmos: Chronotopes of Desire in Travel Writing about Korowai of West Papua. by Rupert Stasch. Journal of Linguistic Anthropology 21(1):1–21. Word Avoidance as a Relation-Making Act: A Paradigm for Analysis of Name Utterance Taboos. by Rupert Stasch. Anthropological Quarterly 84(1):101–120. The Camera and the House: The Semiotics of New Guinea “Treehouses” in Global Visual Culture. by Rupert Stasch. Comparative Studies in Society and History 53(1):75–112. Knowing Minds is a Matter of Authority: Political Dimensions of Opacity Statements in Korowai Moral Psychology. by Rupert Stasch. Anthropological Quarterly 81(2): 443–453. Referent-Wrecking in Korowai: A New Guinea Abuse Register as Ethnosemiotic Protest. by Rupert Stasch. Language in Society 37(1):1–25. The Semiotics of World-Making in Korowai Feast Longhouses. by Rupert Stasch. Language & Communication 23(3/4):359–383. Separateness as a Relation: The Iconicity, Univocality, and Creativity of Korowai Mother-in-law Avoidance. by Rupert Stasch. Journal of the Royal Anthropological Institute (n.s.) 9(2):311–329. Joking Avoidance: A Korowai Pragmatics of Being Two. by Rupert Stasch. American Ethnologist 29(2):335–365. Wikimedia Commons has media related to Korowai. This page was last edited on 14 February 2019, at 12:15 (UTC).